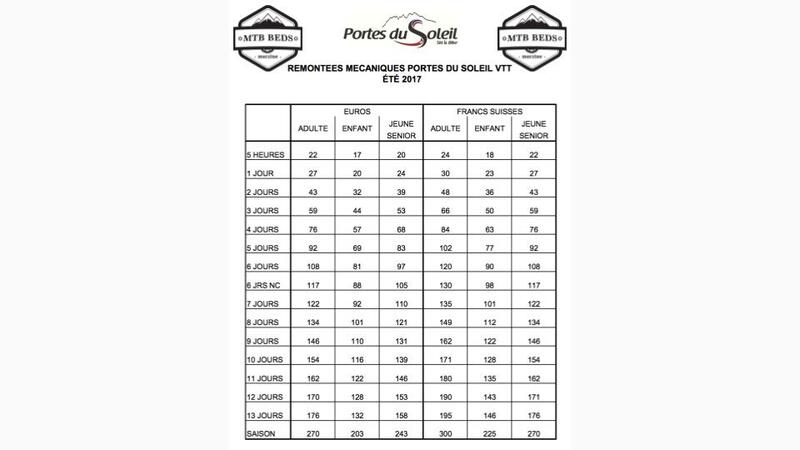 The Morzine and full Portes du Soleil lift pass prices for the 2017 summer season have just been released by the Morzine tourist office and they look very similar to the 2016 Morzine lift pass prices. Morzine is the largest lift linked MTB resort in the world, come and explore it. The Mountain bike lift pass prices for Les Gets, Chatel, Morzine etc have not increased as much as expected over the past few years even with some great new trails like the new red on the Pleney and Super Morzine. we have also seen brand new lift installed by Serma on the Avoriaz side of the mountain and we all know about the high speed new Pleney gondola. 35 laps of the Pleney in a day yes please. See the chart below for more information and prices, you can now also buy a 6 day non consecutive lift pass if you have a two week or 10 day trip you don't have to ride every day and it works out cheaper than day passes. We can offer a 5% discount on full week lift pass purchases, simply let us know how many you would like. We do all the queuing and then you simply rock up and ride! There is also a Morzine MTB season pass available which allows you to ride from the opening weekend n May all the way through until September the 09th when the last lift closes, this will also cover you for Champery which stays open much later into October.